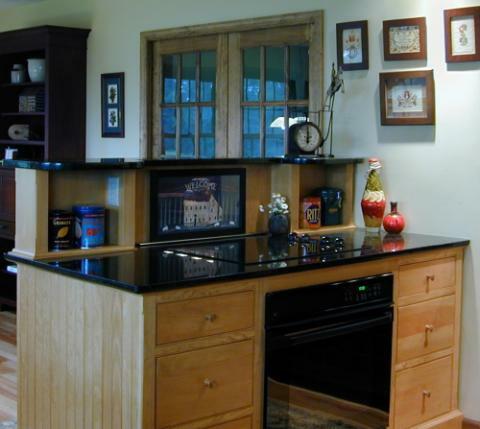 This saltbox style home features six unfitted workstations in an open plan kitchen/breakfast/sun room. 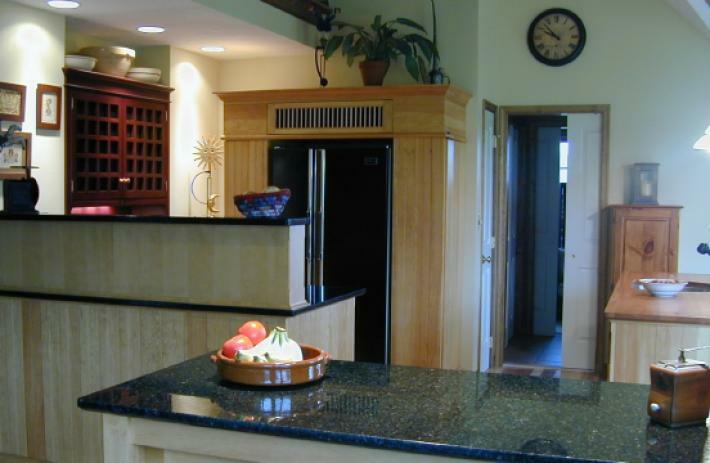 The owners wanted the kitchen area to be the hub of this home and the separate workstations allowed that to happen as communication pathways meander throughout and even above it as its two story ceiling shelters the overlooking balcony as well. The kitchen features two Bombay Mahogany Cupboards (C32C pantry cupboard next to the range and a C32D desk in the breakfast area )with four Old English Pine workstations. The Work Table (WP70) in the foreground acts as a baking table and buffet. The photo above shows the view from the breakfast table. The owners painted their existing refrigerator black before placing it into a PR36-FP Refrigerator/Pantry Workstation that features flanking full height pantries. Even after living with this kitchen for several months, there were still empty shelves in all of the pantries. 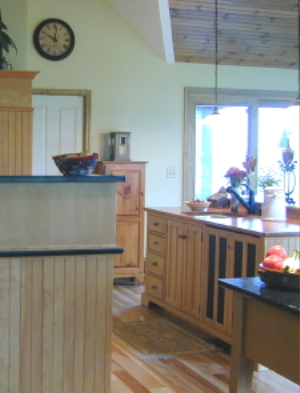 The island Range in the photo above features a cooktop, oven and telescoping downdraft exhaust fan, completely obscured from the breakfast table. This kitchen proves that not all appliances need to be concealed if they are incorporated into beautiful pieces of furniture when creating an open plan room. Here, the breakfast table is behind the camera and the freestanding S84U Sink unit on the right separates the sunken family room from the working kitchen. The owner’s existing dishwasher is completely concealed and will not operate if the the pocket doors are closed (as shown). The white door goes to the powder room and laundry area, while the sliding glass door is the everyday entry to the home that leads to the porch and parking (later to be a garage). So you can see how this open plan kitchen is the true Hub for this very active family. Please click on the following link to discover more about this Open Plan Kitchen.